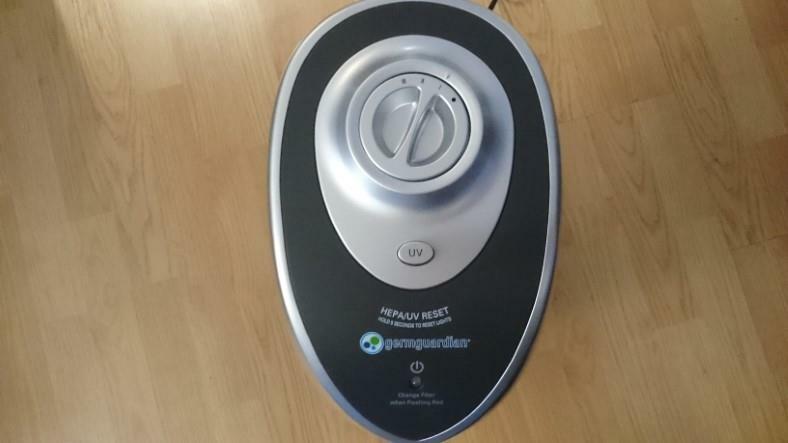 After having to deal with dust and other air quality issues, I picked up a GermGuardian AC4825 of my own. It wasn’t hard to find – after all, it’s one of the most popular purifiers sold today. 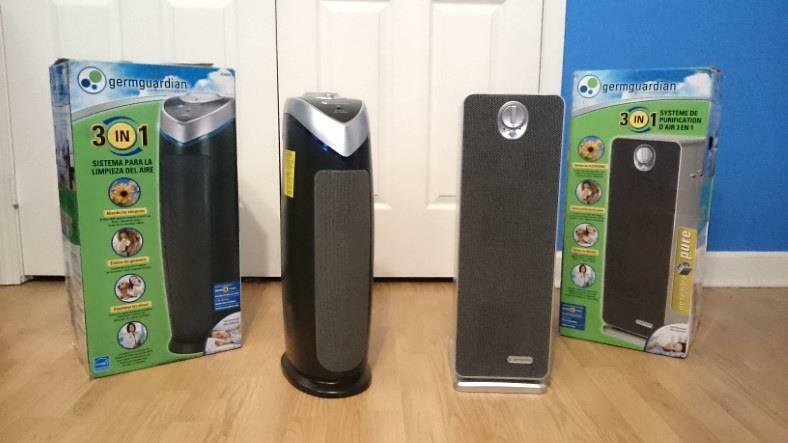 In my GermGuardian AC4825 review I’ll help you decide if it’s a good buy or not. I own it and have tested it myself! I’d love to help you make the best buying decision for your money and experience better air at home just like I have. Believe me when I say a good air purifier is definitely a great buy – but you’ve got to shop wisely. Read on to learn more. You can also jump to the review summary if you like. 8. Does the AC4825 produce ozone? My AC4825 arrived quickly and after removing it from the shipping box, inside was a purifier I’d come to love soon enough. It’s well-packaged and the owner’s manual is placed right on top to be sure you find it easily. Eco-friendly recycled corrugated cardboard is used for the packaging and it’s easy to unbox. We’re off to a great start! I’m no stranger to air purifiers and home air quality products, so I didn’t think I would get excited about another air purifier. It turned out I was wrong. For some reason, it was still fun to pick up my AC4825 from the UPS Store for the first time and unbox it. What is it really like, I wondered? How well does it work? It arrived well-packaged and features recycled cardboard inserts which hold the purifier in place. The owner’s manual is right on top so you can’t miss it when opening it up the first time. After opening and unpacking it (which consisted of removing the corrugated cardboard inserts – styrofoam isn’t used with this one) I finally to check it out and turn it on! The AC4825 is built with a solid, good-feeling ABS plastic body and has a nice low-gloss black finish. The top features a matte silver finish with a satin black top section surrounding the controls. I didn’t get any kind of impressions of it having any poor-quality construction or any similar flaws. It looks good, and honestly I’m happy with it. Personally, I’ve never been a big fan of shiny finishes on products like this, so it’s a relief that it doesn’t stand out in a flashy way in the rooms I’ve used it in. I have to say it’s well put together and well-made. Parts line up well, are tightly assembled, and there aren’t noticeable gaps or quality control issues to speak of. Overall, it looks like it cost more than I actually spent. If there’s one thing I’ve learned over the years, it’s that gaps and misaligned parts are a sign of build issues. There’s none of that here. Operating the AC4825 is extremely easy. In the picture above, you can see 1) the 3-speed fan control, and 2) the ultraviolet-light (UV-C) germ killing feature button switch. The fan control feels great, and the switching is somewhere between a “soft” feel and a firm feel. It’s not too light, and yet not too hard to turn. I’m pretty happy with it, because it doesn’t feel like you’re going to miss position #2 and skip over to #3, for example. The fan switch is actually quiet in operation and smooth to use. 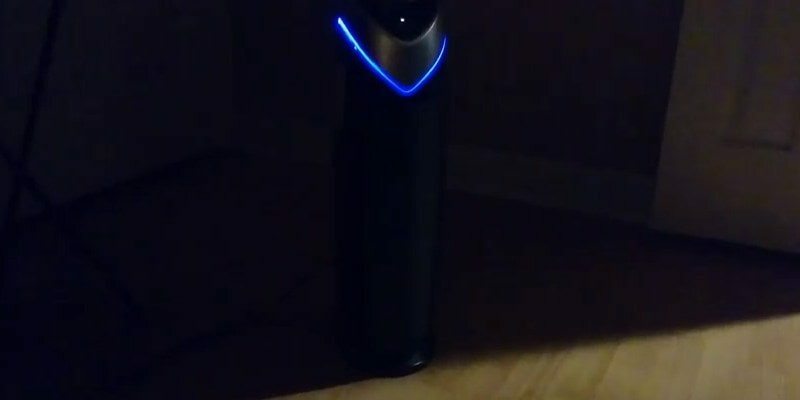 The AC4825, like several other GermGuardian air purifier models, features a bulb and titanium-oxide germ killing feature which radiates germs passing through it and renders them inactive by affecting their molecular and protein structures. However, you’ll have to manually turn on this option. In order to do so, the purifier must be at least in position #1 (low speed) before the control will work. You can tell it’s on by the glowing blue trim around the body as pictured here. When activated, you’ll see the small, thin light strip on the base of the silver decorative top glow blue from inside. Don’t worry though – you’re not in any danger from exposure to ultraviolet light. It’s safely contained inside. I like how this feature in fact is used as a decorative accent when active. That’s a nice touch! One complaint I have, however, is that once it’s in use, switching the purifier off then on again won’t re-activate the feature. You’ll have to do so manually, as there’s no memory feature (unlike some competitors) to restore the setting upon then next power up. While not a “deal breaker”, its small detail to know about. If you’re not already familiar with it, it’s helpful to understand more about the Clean Air Delivery Rate (CADR) standard used by the industry. This is a voluntary lab-tested rating of an air purifier’s cleaning ability. The AC4825’s CADR ratings are shown here. AHAM is an organization that verifies the testing results of home appliances & perform lab testing for appliance manufacturers although it’s not required by law. In simple terms, it’s a rating used to help you know before buying an air purifier’s effectiveness. 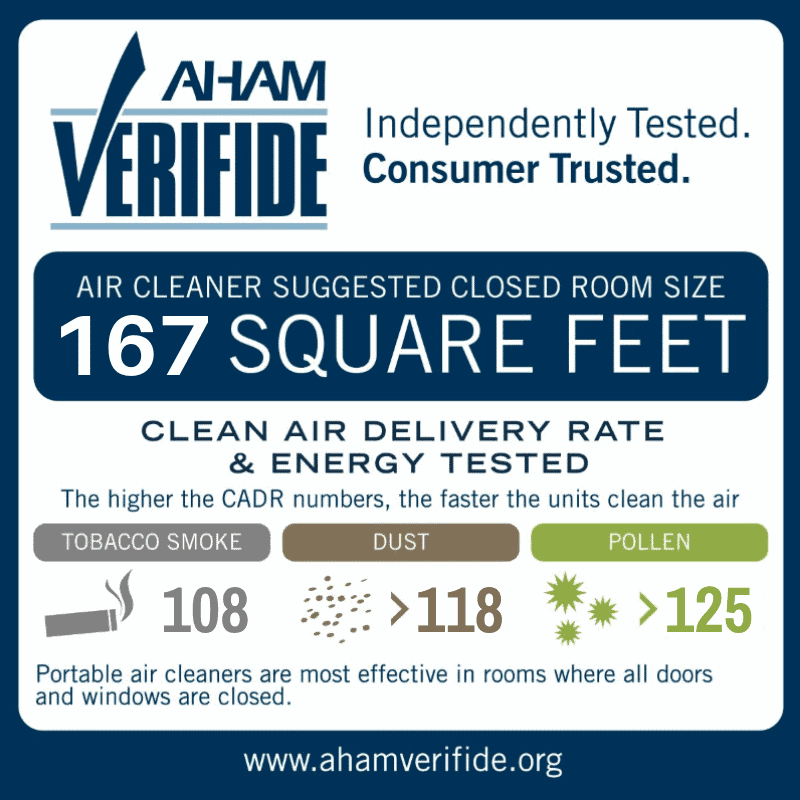 The rating numbers mean “higher is better” as they’re lab tested using a series of test to find out their air cleaning effectiveness. In the case of this model the specs are good and you’re assured you’re getting proven performance. At nearly 22″ in height, it’s definitely not a small device. “Tower” air purifiers are simply those that are taller and don’t have a low-profile design and stand tall on the floor. 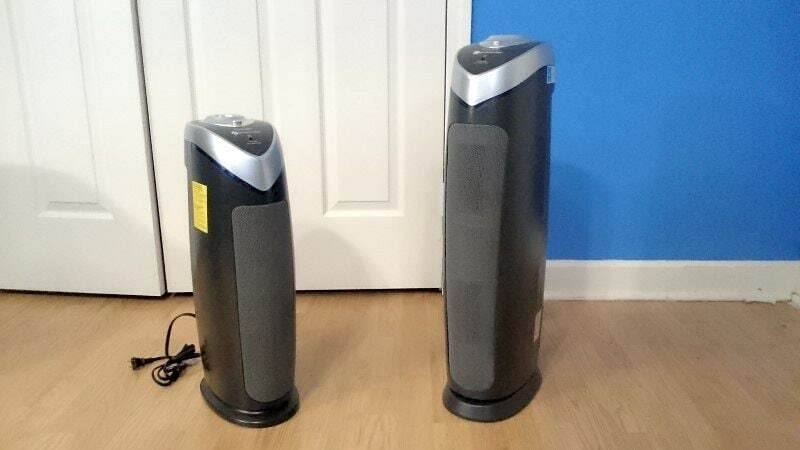 They’re taller due to having more fans to provide more air flow. It’s important to make sure you have enough room before buying. A great place is near a door and not backed into a corner in the room. Be sure to give it lots of room (about 2 feet in front and back) as it needs space to circulate air efficiently. One thing I really like is being able to carry it easily from place to place at home using the built-in carrying handle area. At the rear of the top, there’s a recessed area where your fingers have plenty of room to pick it up securely. It’s a nice touch I didn’t notice at first bout after moving it around to find the ideal place in my home, I found it handy. Pictured: I measured power use (in Watts) for all 4 recordings (3 speeds, plus the off setting). I recorded power meter readings both with and without the UV-C feature switched on. Overall, it uses a relatively small amount and it’s not an energy hog at all. How many watts does the AC4825 use? Unfortunately the owner’s manual doesn’t go into detail about energy for the various modes you can use. 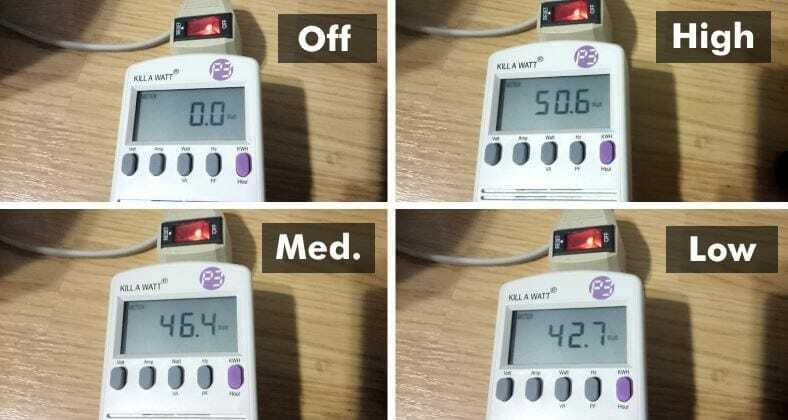 Rather than guess, I measured power use in Watts for all speed settings with and without the UV-C feature switched on. Note that the the UV-C option uses about 4W of power (larger models use 8W). Overall, it doesn’t use much power at any setting although it’s a bit more efficient on high or medium. For those speeds the fan is running faster and you’ll get faster air cleaning. The drawback is a bit more noise. As the UV-C feature uses only about 4W, there’s no need to worry if leaving it on long-term will affect your energy bill. My purifier’s filter (the FLT4825 filter that’s installed at the factory) trapped a HUGE amount of dust! You can prolong the pre-filter’s life by vacuuming off excessive dust or hair as needed, which I did. Dust is a really big air quality problem in my home and the AC4825 made a big difference when in use. As it’s rated for up to 167 square feet by the manufacturer, it’s well suited for medium sized rooms, although there’s absolutely no reason you can’t use it in small bedrooms. You can also use it in rooms somewhat above the specified 167 sq. feet – that’s an estimate. I’ve let it run all day while at work so I could come home to fresh, clean air, and it works well. The thing to remember is that air purifiers work by cycling air in a room and it takes time to cycle & filter the entire room’s air. This model is recommended for room sizes that are medium in size. That being said, there’s absolutely no reason it can’t be used in a small room! In fact, you’ll find that it cleans the air even faster in that case. It’s sized for rooms about 167 square feet in size which is roughly a 10 x 16.5 ft room. Bear in mind that this is an approximate size used – it doesn’t have to be used in a room exactly that size. When used in larger rooms the amount of time required to fully cycle and clean the air increases depending on the amount of space inside the room. 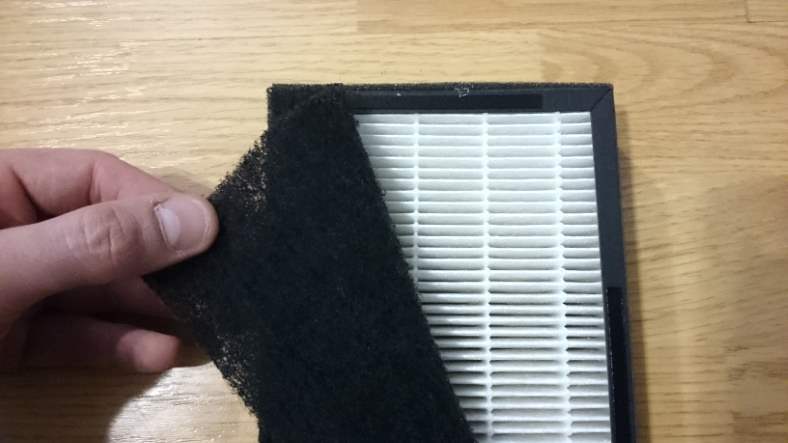 The AC4825’s HEPA filter (seen here) section is made up of a folded, dense fiber material. A second section, the pre-filter/activated carbon filter is responsible for trapping larger particles as well as odors and volatile organic compounds (VOCs) in the air. It’s capable of excellent filtering ability and works well. The filter can capture nearly 100% of all particulates in its airflow down to 0.3 microns in size! The high efficiency particulate air (HEPA) filter is fantastic for removing the most common air quality issues (especially those that cause allergies!). 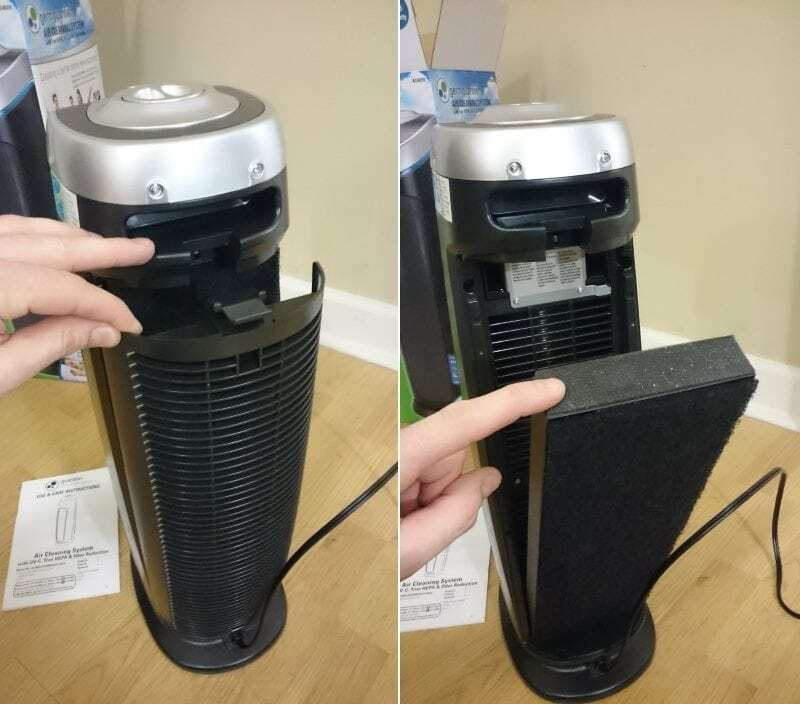 Essentially, this is a 2-stage filter assembly made up of 2 parts: the pre-filter/activated carbon filter and an extra 2nd section, the HEPA filter, for a total of 3 filters. The pre-filter section is a less dense & thin section covering the active carbon filter. It’s job it so first capture larger items in the air like pet hair, dust, and so on. The active carbon filter traps odors and other chemical substances in the air. Finally, the HEPA filter captures an amazing 99.97% of particles passing through it down to 0.3 microns in size. That’s less that 1/1,000,000 of a meter! That means it’s capable of capturing elements that are microscopic in size. It’s a great filter and works well. I noticed fresher air soon after using it for the first time, and I’m pleased with it. By touching the UV button on top, you switch on the germ killing feature. It’s a great addition not found in many competing products. It’s also perfectly silent and doesn’t cause any noise or produce any side effects. When on, the blue trim on the base of the silver top section glows blue to show the bulb is working. The technology works using the science of ultraviolet light (UV) to affect microbes in the air, coupled with titanium dioxide to remove airborne contaminants. caused by smoking, cooking and pets. Essentially, air passing through has the UV light irradiating into it and microbes in the air are destroyed. It can help prevent sickness and other respiratory problems caused by germs. Does the AC4825 produce ozone? Some people wonder if air purifiers can cause headaches. 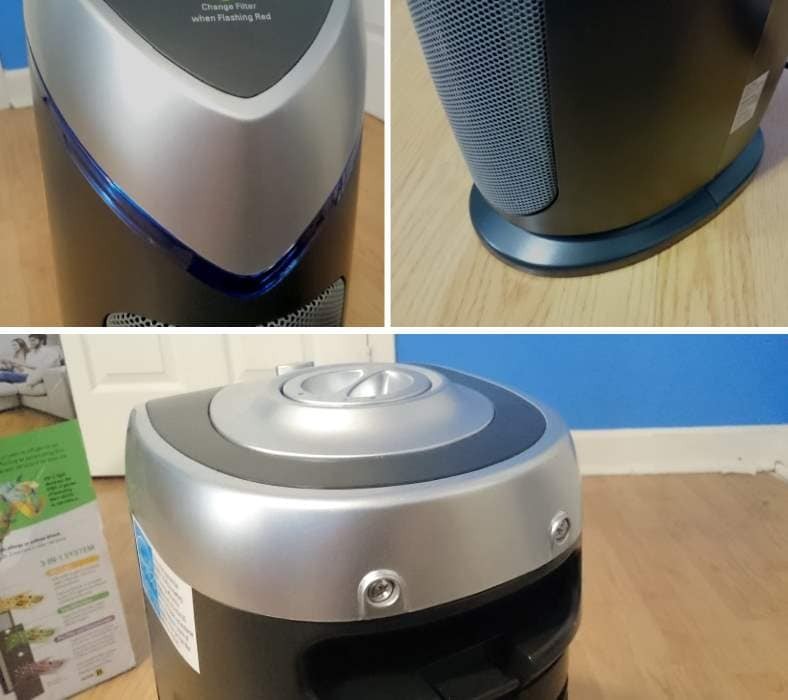 As I explain more in this post, an air purifier based on filters like you see here doesn’t produce any emissions to cause headaches or any other unpleasant reactions. The UV-C option is completely enclosed and you’re in no danger of skin UV exposure. The AC4825 is perfectly safe and healthy as it does not produce unsafe ozone levels. In fact it produces 1/20th of the level considered acceptable by the Health Canada Guideline 2010 based on exposure levels & time considered acceptable. You’re perfectly safe and need not worry about ozone when using it. The purifier features a helpful way of indicating when it’s time to check and possibly replace the filters. After about 6 months of use, the green LED near the fan switch will blink red to indicate this (see the chart below). If your filter has had very light use and isn’t heavily used, you can reset the indicator by holding the UV-C button for 5 seconds. In the case of replacement for the UV-C feature’s bulb, the blue light will blink. The FLT4825 is the genuine replacement filter from GermGuardian. It includes both the HEPA filter and an active carbon filter section, too. While the genuine replacement filter is only around $30+, you can save money by buying 3rd party replacement filters. Expect to replace a filter after about 6-8 months; however, this depends greatly on use. For example, if you’re a smoker or have indoor pets you can definitely expect to replace the filter when reminded. For lighter use the life will be extended even further. 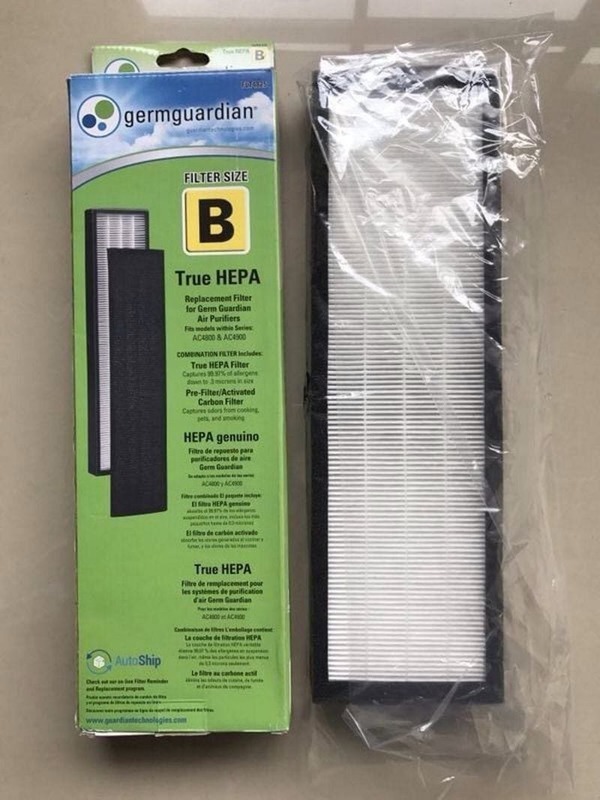 Replacement filters cost around $30 (or a bit over that) for the genuine GermGuardian brand. However, 3rd party budget models are available which contain 1 less expensive filter or 2 filters in the box. If you’re concerned about maintenance costs that’s a great option. How hard is it to replace the filter? 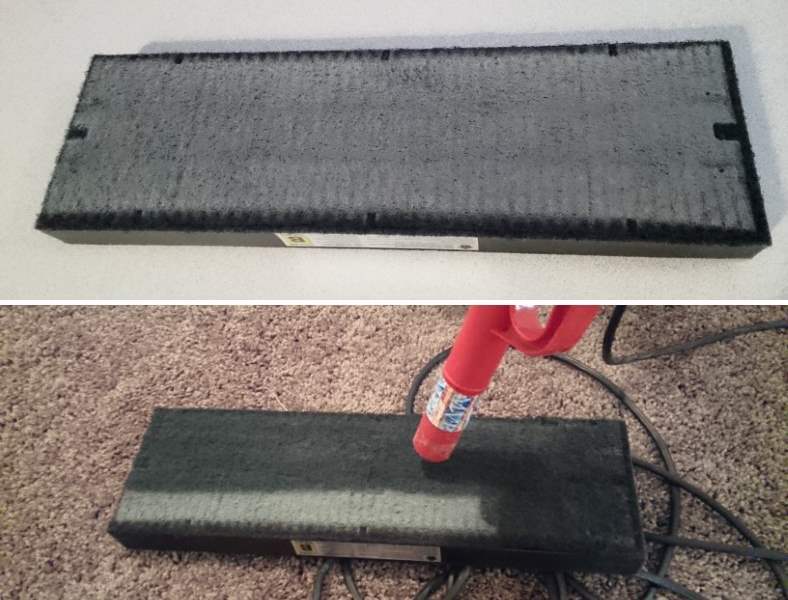 Filter replacement is easy and only takes a few seconds. I was pleasantly surprised with how easy it is. …and you’re done! I’ve demonstrated this in my video review as well, so be sure to watch that if you’re interested. UV bulb replacement is pretty straightforward. The owner’s manual clarifies what you’ll need to do for bulb replacement (which is typically after 10-12 months). You’ll need a Phillips screwdriver (not included) to remove 2 screws, unplug the old bulb, and insert then new one. Overall, it’s pretty simple to do, so don’t worry about it. Additionally, if you rarely use the feature you’ll basically never have to do it, anyway. 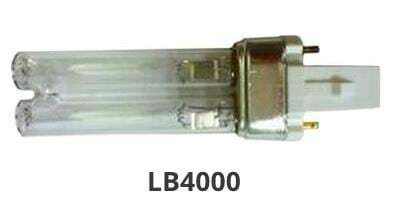 The GermGuardian replacement UV bulb #LB4000. Expect to pay around $25 or so for one when replacing it. The company’s life rating is 10-12 months, although a few owners have reported shorter life (which unfortunately is a problem with many bulbs in general). Replacement bulbs cost about $25. In order to replace the bulb, you’ll need a Phillips head screwdriver to remove the rear metal bulb cover. It’s accessible once you’ve removed the filter after opening the cover. Once the metal cover is removed you simply slide out the old bulb and replace it with a new one. Overall, it’s easy to do. The bulb is rated at 10-12 months life expectancy, although a few owners have reported that their bulbs died after only a few months. 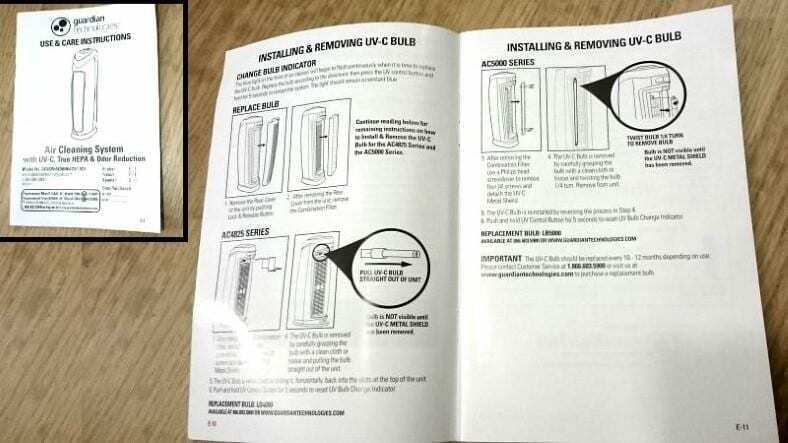 I was pleasantly surprised to find that the purifier included a solid, well-made owner’s manual with clear instructions and helpful information. Basic information like replacing the filter,UV bulb replacement, and user operation is clearly explained. The English section is very clear and helpful. It contain 12 pages of information you’ll want to review before operating it, but honestly? This model is so easy and hassle-free to use you won’t need instructions, ha ha. Don’t worry, I won’t leave any of the specifications off – I’ll provide them below. The company claims that the unit has low noise during use, and in my testing I found it to be true. High (#3) has a moderate level of noise and can be masked by the sound of your TV or radio. However it’s fairly noticeable but not loud. The high setting is especially helpful for fast and maximum cleaning of contaminated air. Smoke, dust, and more come to mind. It’s honestly very quiet and I’ve found it pleasant-sounding when in use. While not as quiet during low-speed like a few competitors such as the Levoit LV-H132, I’m happy with it. The main reason that the AC4825 is a few decibels louder is because it has not one but 2 fan sections and produces a bit more sound. 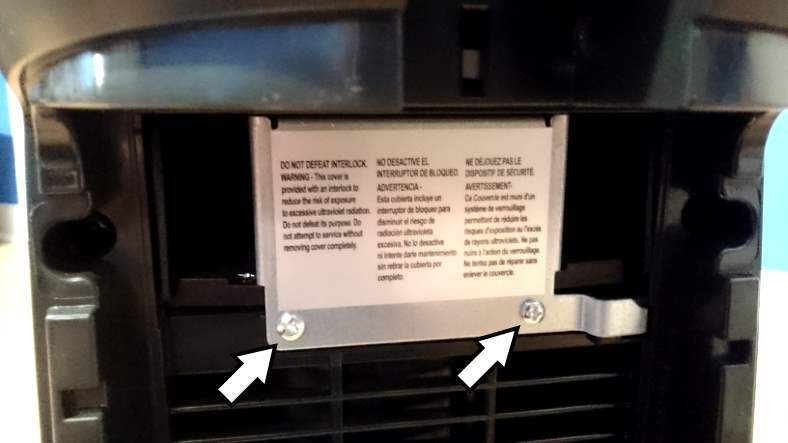 Two fans move much more air than 1 and therefore of course add a little bit more noise than one alone. That’s a trade-off when using a more powerful purifier like this. 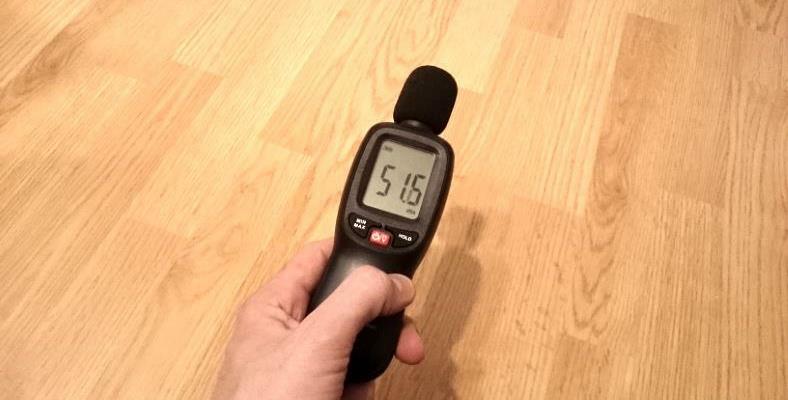 I measured volume levels using a nice digital decibel sound level meter at 1 meter (3.28 ft) from the purifier. I do have one minor gripe: while in operation, and although it’s fairly quiet, there’s a characteristic sound these devices produce. Because of the dual-fan section design as well as both the motor and its electrical drive, the combination of these factors causes it to produces a “whirring” noise while in use. The noise isn’t annoying or bothersome in my opinion, but it’s something to be aware of beforehand. The top-facing power-on LED is a green soft-glow type of indicator. It’s not too bright in nature, but still slightly noticeable in the dark. 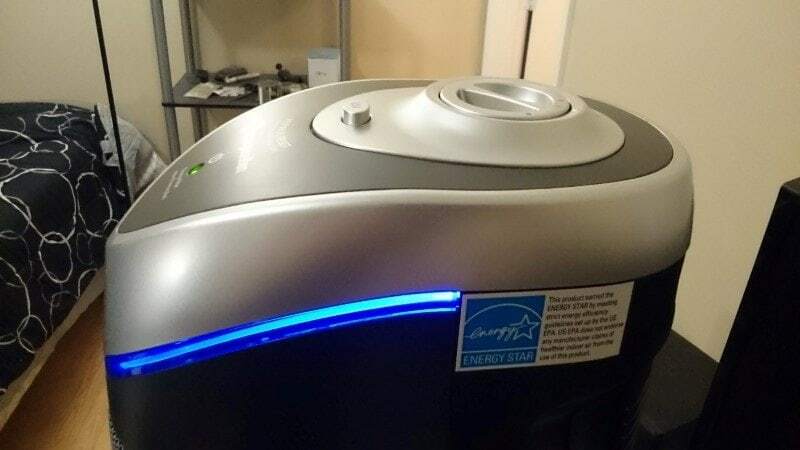 The blue glow being produced when the UV-C feature is in used isn’t very bright, but the human eye is more sensitive to blue light. For that reason, my opinion is that for many people it will be fine, but if you’re especially sensitive to light when concentrating on a task on sleeping it could be an issue. In that case I recommend leaving the UV turned off during those times or moving it out of the way where you can’t notice it. Not to worry though: the light brightness isn’t enough to “light up a room” or something unacceptable like that. Instead it has a soft glow that’s not a problem in my opinion. The AC4825 (left) has a cool-looking twin, the AC4900CA (right). It’s identical in features and performance. Interestingly enough, sometimes one model is priced lower than the other and you can save a few dollars! You might not know this, but the AC4825 actually has a sibling called the AC4900CA, which is identical in performance, features, and specifications. 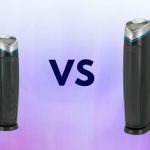 I’ve thoroughly compared the two here: GermGuardian AC4825 vs AC4900CA. I’ve seen it sold for a few dollars less (for example here at Amazon) and I think the styling is nice. It’s definitely worth considering, as while not as popular as its counterpart it has the same great quality and is otherwise identical. The “big brother” to the AC4825, the AC5000E is nearly identical except for room size coverage and the UV-C bulb. It’s a great addition to your home as well. Be sure to check out my detailed comparison if you’re interested in the AC4825 but have a large room! In case you’re not familiar with it, the AC5000 is almost identical except for its size (near 28″ tall) and better room coverage. 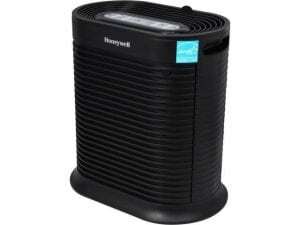 It too is an excellent large-room air purifier and is recommended for rooms up to 193 square feet in size (med.-large). Just like the AC4825, it features a UV-C germ killing feature although the bulb design is different. I’ve enjoyed owning one so much that I wrote a detailed comparison of the AC4825 vs AC5000 here. The closest rival to the AC4825 in my opinion is the Honeywell HPA100. It offers some features the GermGuardian doesn’t, although it’s lacking in a few areas. It’s also available in a white version. Room size coverage is 155 sq. ft. In my opinion the AC4825 is a solid, well-built, and easy to use purifier. However, there’s definitely no shortage of competition. Although it can’t come close to the popularity of the AC4825, the Honeywell HPA100 is a solid contender with about the same room size coverage. As I’ve reviewed several other Honeywell models like the HPA160 you see here, I cant verify their quality and they’re pleasant to use. However, there’s no germ killing feature offered. That’s absent in the Honeywell HPA series of purifiers, and it’s a shame. You’ll also pay a few dollars less for the GermGuardian model as well. Additionally, the pre-filter in the HPA series is a little bit more thin than the GermGuardian family uses. The touch controls of the HPA100 are nice to have but to be honest, I’ve haven’t missed them at all. I still use my AC4825 regularly and find it so simple and easy to use…it’s still one of my favorites! However, if having an auto-off timer is an important feature for you, it’s worth your while to check out the impressive reviews for the HPA100 at Amazon today. Honestly, I’ve got very little to complain about with the AC4825. It cleans the air well, it’s extremely simple to use, and it’s quiet. I love it! The AC4825 makes enjoying clean, fresh air easy and affordable. Watch out for high prices, however! Head over to find the current sale price (and get free shipping!) at Amazon. A well-performing air purifier that you'll be glad to own. No wonder it's one of the best-selling models today. The GermGuardian AC4825 is a no-frills tower air purifier with simple operation and good air cleaning ability. It lacks a few fancier features when compared to more expensive models, but it's a better value. Room coverage (med. rooms, 155 sq ft) is better than many similarly priced competitors. Quality and build are very good; maintenance is easy to perform. It's a quiet and pleasant-sounding purifier in my testing. The prefilter/HEPA filters work well to remove airborne particulates and odors. The UV-C feature is a bonus germ-killing option. One of the best-selling air purifiers available today, it's a solid, sensible choice for fresher air. Hi there Jo! You could do that…but it greatly depends on what type of air quality problem you’re dealing with. But honestly, that’s right at 4 times the size of rooms it’s recommended for. That means it would take 4 times as long to cycle and clean the air in that room. I can’t really recommend it in that case. I would honestly at least recommend getting two of the AC5000 (193 sq. ft) models. 600 square feet is quite a bit. You could also check out the Honeywell HPA300 (465 sq. ft) which is a nice model here: https://afresherhome.com/honeywell-hpa-300-review/ and a good value for the room size coverage. It has some extra features, too. I’d like you to spend your money on what’s most beneficial to you, so have a look at that one. It’s nice and very powerful. I enjoyed using it. I have the Guardian and planning to get another one I like it so well. When you turn on UV is it suppose to stay on all time unless you unplug it or turn it back off? Mine automatically goes off after 10 minutes. Maybe I misunderstood you but I would love for mine to stay on longer. That was the only complaint I had. Hi Missy. Yes, that’s one thing I don’t like and listed as a “con”: there’s no memory on the UV-C feature so when you turn the purifier off it switches back off again the next time the purifier is used. A minor annoyance I think for an otherwise very good product. I have not had an issue with mine turning off automatically on any of the GermGuardian models I own & have tested. It sounds like it could potentially be a bulb issue. One thing you can try is pushing and holding the UV-C button for 5 seconds to restart the controller and see what comes of that. Hola and hi! Buen pregunta! (Good question). I don’t advise it, and here’s why: your living room size is 4x that of the rated coverage for the AC4825. Moving the purifier around won’t really have any effect in most cases. That means it won’t be able to circulate and clean the air anywhere near the rate it was designed for and that will help you. You won’t be happy with the results in that case. You could use 4 of them, but obviously that’s not cost-effective or convenient. Using two of its big brother the AC5000 would be better but still not quite enough. My advice would be to look at the Honeywell HPA300, which has room coverage of 465 sq. ft. and also has a high-speed Turbo mode that moves a lot of air quickly. It’s a nice one and more cost-effective than using multiple smaller GermGuardian units. It’s a good deal for the price (under $250). I hope this helps! Have a nice day.